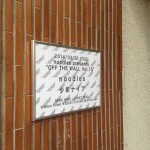 We played at Fever in Tokyo with noodles. We went to Tokyo by Shinkansen. Train lunch is one of my pleasures. 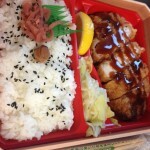 I had ”Katsu” lunch box. 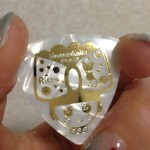 Ritsuko new picks came out!! It designed by my friend. She is matrioshka artist called ”nicori”. I will bring to EU and US tour!! 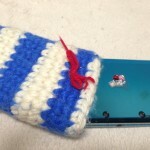 It’s my DS case that was made by Yoko from noodles. I’ve been using it regularly. noodles played a song called”She, Her”. 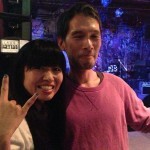 Before joining Shonen Knife, I’ve played with them. At that time, they played the song, and I liked it. I talked to them that, and then they gave me their CD. They were so kind to me who was an unknown band. I’ve been fan of them since then!! I hope to go to tour with them in the near future. It was a perfect weather for a show!! We made an appearance on an Osakan festival called”Sakai Meeting”. 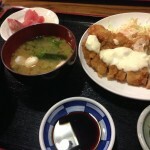 I ate Chiken Katsu meal(deep-fried breaded chiken) for lunch. You know, Katsu(cutlet) is my lucky food!! After the show, we appeared on the radio. We played on the biggest stage, and many people watched our show. After hours, I watched another bands, and had a beer. I really enjoyed Sakai meeting to the fullest. 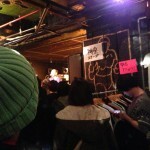 We played at Fandango in Osaka. 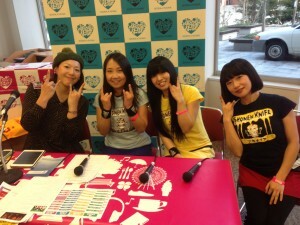 I think Fandango as sacred ground of Shonen Knife!! 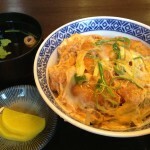 Recently I always have Katsu don(pork cutlet rice bowl) before a show. Katsu don is lucky food for me!! He looks jentle, but his sound is very very loud!! It was a rock’n roll night. 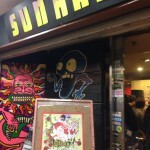 I used to go to Janis in Shinsaibasi for watching a show as an audience. The venue has delicious foods and drinks. We played a song from our new album”Overdrive” for the 1st time. It’s my lead vocal song. I was sure of it’s a rock number. The another act, Kinoco Hotel is a 4peace girls band. I put on Kinoco Hotel T shirt . The another acts are also girls band and girl’s vocal unit. It was a spectacular night!! 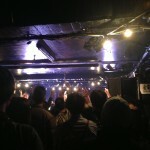 We appeared on Osaka Roack Day. 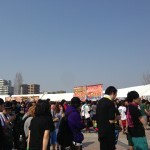 Osaka Rock Day is a rock event in Osaka rock city!! It has got a unique lineup!! I enjyoed the event a lot. Osaka Rock Day has 3stages called ”Kinryu stage”, ”Kamukura stage”, ”Tenichi stage”. 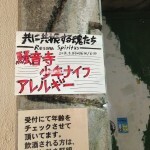 They are names of popular Ramen shops in Kansai area. We played at ”Tenichi stage”. It’s my most favorite Ramen shop!! It was the smallest stage. The venue was packed, so the air was thin. The heat made my head swim. It was an exercise to my body and inner strength. 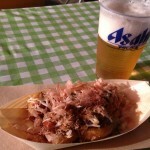 After the show, I had Takoyaki(octopus dumpling) with beer!! Takoyaki is a soul food for Osakan people. I like Takoyaki as much as Ramen.